Joey Rodriguez was born June 24th 1975 in Sunnyside Washington to Joe Rodriguez and Donna Lindsay Rodriguez Joey passed away on April 10th 2019 at Sunnyside Astoria Hospital Joey spent his entire life in the Sunnyside, Outlook area graduating with the class of 1993 for those who knew Joey well knew he had a passion for music and would not turn down an invitation to do karaoke, he liked all forms, he loved old cars and belong to the car club A's & 8's for a number of years he was an avid collector of many things from books, movies ,music and most of all his beloved Star Wars , Joey leaves behind many sad empty hearts .Joey is survived by his son Benjamin Rodriguez his parents Joe and Donna Rodriguez and his brother Christopher Rodriguez he is also survived by numerous aunts and uncles and a multitude of cousins. Like a Bird on a Wire like a drunk in a midnight choir I have tried in my way to be free. 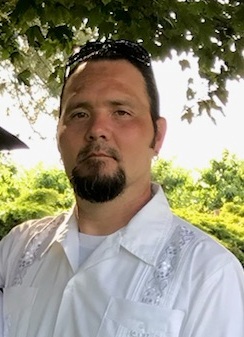 Viewing and visitation will be held on Tuesday, April 16, 2019 from 4:00 p.m. to 8:00 p.m. and Wednesday, April 17, 2019 from 9:00 a.m. to 11:00 a.m. at the Smith Funeral Home, Sunnyside, WA. Funeral service will be held on Wednesday, April 17, 2019 at 12:00 Noon at the Smith Funeral Home, Sunnyside, WA. Burial will follow at the Lower Valley Memorial Gardens in Sunnyside, WA. Those wishing to sign Joey's online memorial book may do so at www.funeralhomesmith.com Smith Funeral Home in care of arrangements.